This paper is the first of series discussing the opportunity for long-term institutional investors such as pension funds, insurance companies or sovereign wealth funds, to invest in large portfolios of infrastructure debt, both to manage their liabilities and to minimise their exposure to capital market volatility. Our analysis focuses on project finance debt since it represents the bulk of existing and, in all likelihood, future infrastructure debt. Moreover, contrary to the notion of `infrastructure’, project finance benefits from a clear and internationally recognised definition. Indeed, the distinctive nature of infrastructure project debt is best captured through the lens of credit risk. Moreover, infrastructure project finance debt is typically priced as a floating rate instrument using a benchmark rate and a credit spread. This allows us to ignore the role of interest rate risk in this paper and to concentrate on the potential for credit risk diversification in infrastructure debt portfolios. While we explore empirically the impact of the credit cycle on the level of credit spreads in infrastructure debt in this paper, following Altman (1996) we later assume that changes in interest rates are random and average capital gains zero. Hence, we also ignore any accounting or valuation issues. The matter of infrastructure debt valuation is the topic of a second, forthcoming paper in this series. In this paper, our analysis of infrastructure debt is centred on portfolio construction from the perspective of credit risk: the determinants of credit spreads, measures of expected and unexpected returns, and default correlations. The opportunity for institutional investors to become involved in infrastructure debt matters for two reasons: evolution and adaptation in institutional money management, and public policy. First, infrastructure debt is a fixed income instrument characterised by long durations and typically high credit quality and, as such, can contribute to meeting institutional investors’ long-term objectives. Infrastructure investment has become a theme of increasing interest amongst investors, along with a growing variety of alternative investments, following the 2007-2009 financial crisis and the challenges posed to portfolio diversification using traditional asset classes during that period. In this context, infrastructure investment is expected to have attractive properties. According to what we call the `infrastructure investment narrative’ (BlancBrude, 2013b), tangible infrastructure assets, immobile and demanding high sunk capital costs and long repayment periods, create monopolies thanks to barriers to entry and increasing returns to scale. Thus, these investments are expected to benefit from low elasticity of demand for the services they provide and low return covariance with other investments. Being predominantly unlisted, they are also expected to pay an illiquidity premium and yield attractive risk-adjusted returns. Unlisted infrastructure debt is thus expected to combine the attractiveness of illiquid investments with long durations and a focus on predictable cash flows. However, accessing the intuitive characteristics of underlying infrastructure investments such as road projects or utilities remains difficult and underdeveloped, especially on the debt side. Second, the idea that institutional money can be invested in infrastructure projects has given rise to numerous policy initiatives to channel these funds into new infrastructure investment in Europe, the U.S. and beyond. The objectives of these policies vary, from the development of capital markets, to funding new infrastructure that governments and difficult to finance themselves but may play a role in supporting future economic growth, to creating jobs immediately thanks to investment in large public works. In effect, such are public sector concerns about the long-term financing of future growth that the European Commission recently asked the European insurance and pension regulator (EIOPA) to consider lowering the Solvency-2 capital requirements to accommodate long-term investments like infrastructure by institutional investors (Faull, 2012). From a broader perspective, investing a proportion of pension assets in the development of infrastructure projects which in turn contribute to the improvement of total factor productivity may also be a counter measure in countries with declining demographics, to help make public and private pension systems more sustainable (see Lee and Mason, 2011, for a review of the question of the second demographic dividend). Thus, insofar as final investors can benefit from infrastructure investment, the development of infrastructure debt investment solutions also makes sense from a public policy point of view. So far, most infrastructure investments by institutional investors, whether they are in listed, unlisted, direct or indirect, have taken place on the equity side. However, most privately developed (and thus investable) underlying infrastructure projects are financed using significant amounts of debt. On average, 75% of new infrastructure project financing requires originating new credit instruments. From a volume perspective, if infrastructure investing should be on par with infrastructure financing, it should consist mainly of infrastructure debt. Today, investment solutions in infrastructure debt are only beginning to appear and their development will play an instrumental role in the ability of pension funds and insurance companies to access genuinely long-term, cash flow oriented assets to help them achieve their liability-driven investment objectives. But for the investment needs of institutional investors to converge with those of the public sector, investment must be made for the most part in new or so-called `greenfield’ infrastructure projects. So far however, pension funds and insurance companies have shown little interest in funding new projects, mainly for fear of `construction risk’ i.e. the perception that new infrastructure projects entail significantly more risk than existing ones. Despite public sector initiatives offering construction risk guarantees in various forms, institutional investors continue to shy away from construction risk. 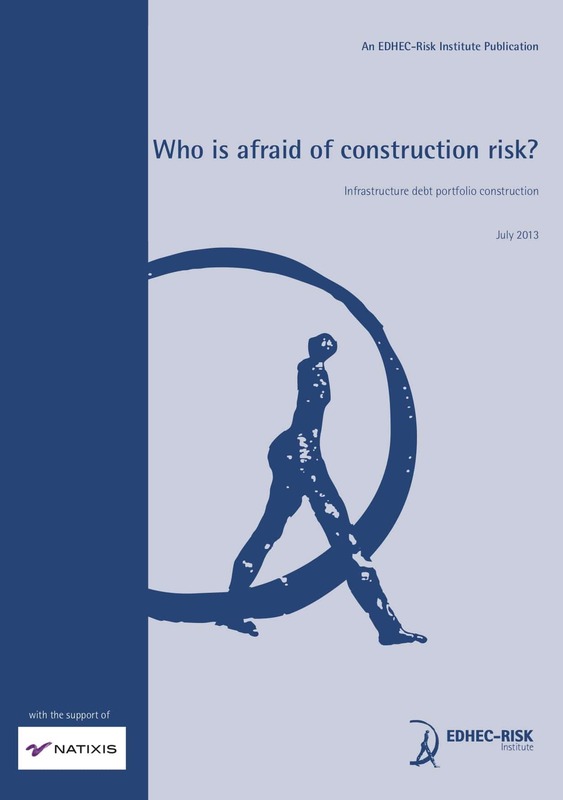 In this paper, we conclude that investors should embrace construction risk. Not only because, as we test in a forthcoming paper (Blanc-Brude and Makovsek, 2013), construction risk is not as high in private infrastructure investment as investors often imagine, but especially because it should be seen as a welcome diversifier of credit risk in infrastructure debt portfolios. In the first part of the paper, we discuss the nature of infrastructure project financing and review the conclusions of existing academic work on corporate financing, the role of banks in the decision to finance new projects and originate new loans in project finance. The corporate finance literature recognises the distinctive nature of project financing. In this context, we argue that infrastructure project finance debt is the result of specific choices about the financing of new investment projects by private firms or the public sector. First, it implies a preference for delegating this investment to a third party via a dedicated corporate structure. This, in turn requires the selection of the project for dedicated limited-recourse financing by lenders, following the self-selection of project sponsors to invest equity at risk in a single-project, highly leveraged special purpose entity (SPE). As a consequence, we argue that the average infrastructure project financing i.e. the bulk of investable infrastructure securities, is unlikely to be the same thing than the average infrastructure project. Instead, only high quality projects and managers should be found within structures that create such self-imposed, high-powered incentives and discipline mechanisms, while the remaining infrastructure projects are typically financed directly by the public sector. Project finance, because it is single purpose, time-bound and self-contained has to demonstrate financial viability ex ante with a high degree of probability. In other words, project finance leads to self-selection and signalling that should minimise the adverse selection and moral hazard which otherwise characterises corporate finance, especially on the credit side. Project finance can be seen as a specific form of corporate governance, in which lenders play an instrumental role at the investment decision stage. We argue that the structuring of project finance debt can be described as an optimisation exercise in which lenders can set most of the parameters usually controlled by the management of the firm in classic corporate finance. In particular, lenders can use the price and non-price dimensions of debt instruments including maturity and repayment profiles, to maximise the net present value of project debt, while minimising credit risk through the use of covenants and extensive control rights over the project free cash flows. Hence, because of the endogenous nature of credit risk in project finance, infrastructure debt is fundamentally different from corporate debt. In the second part of this paper, we analyse the determinants of project loan pricing, i.e. the determinants of infrastructure project finance debt spreads over a benchmark rate. We conduct the first panel regression analysis of infrastructure loans and ànd that the turning of the credit cycle after 2008, while it contributed significantly to increasing the average level of credit spreads, did not change the relationship between risk factors and risk pricing in project finance. We show that infrastructure debt instruments have two pricing dimensions: on a cross-sectional basis, project risk factors explain average spread levels between loans to projects with different contractual structures; on a longitudinal basis, individual project loans are priced to follow a down-trending path reflecting the continued change of each project’s risk profile as it deleverages. The same risk factors that appear completely idiosyncratic on a cross-sectional basis, and thus fail to explain the average level of loan spreads, such as construction risk or leverage, are also systematic risk factors when approached through the lens of time series, and explain the change in risk profile that justifies the tendency of infrastructure project loan spreads to decrease over time. Hence, there are two systematic and (potentially) remunerated dimensions of credit risk in infrastructure project finance debt: difference in credit risk between loans and within loans i.e. the opportunity exists to invest in different average levels of credit risk (say, public-private contracts vs. merchant power plants) but also at different times during each loan’s lifecycle, also capturing different levels of credit risk. In the third part, we review one of the most comprehensive datasets on defaults and recovery in project finance, which was provided courtesy of Moody’s. We confirm reports that default rates are low in project finance and recovery levels very high. We also and that the credit risk migration of project finance debt can be modelled as a continuous function of time from origination for the average individual loan i.e. as project loans mature they become systematically less likely to default. Drawing from the credit risk literature we propose an expected return measure for an infrastructure debt portfolio, calculated as the difference between the credit spreads discussed previously and the expected loss, itself the product of probability of default (PD) and loss given default (LGD). We introduce a year-from-origination notation to account for the changing nature of credit risk in infrastructure debt as well as the presence of time-variant credit spreads. Likewise, we propose a portfolio risk measure adapted from Altman (1996): the unexpected loss measure as the product of the LGD estimate and the variance of the PD, which follows a Bernoulli distribution and is thus easily calculated from observed or modelled PDs. We conclude that the predictable credit risk migrations found in infrastructure debt match the observed change in spread that characterises debt pricing in project finance and that their combination can play an important role in a portfolio of infrastructure loans. Having determined an expected return and a credit risk measure for infrastructure project debt, we address the question of default correlations and portfolio construction in the fourth and final part of this paper. We begin by developing an empirical analysis of default correlations for project finance debt. The corporate finance literature focuses on the role of the business cycle in explaining changes in default correlations between corporate credits while considering the average level of default correlation to be fixed and low, even zero. However, the predictable credit risk migrations of project loans provides an alternative dimension to think about default correlations in project finance. We use panel regression analysis to separate the effect of the business cycle from that of year from origination. We show that the lifecycle of project debt explains a significant proportion of default rates and thus signals a predictable decrease in default correlations with the lifecycle. We use these findings to build a default correlation matrix across years from origination i.e. as a function of the lifecycle. Finally, we combine our estimates of expected return and risk for project finance debt with our results for default correlations across the lifecycle to build a one-period portfolio of infrastructure, thus treating each year in the lifecycle as a different asset. We show that a significant diversification potential exists across the project lifecycle. In particular, we conclude that the earlier years of project development during which project debt is more likely to default but is also better remunerated provide diversification potential in a portfolio of infrastructure debt. Finally, we argue that this dimension of infrastructure debt, because it is systematic and thus predictable, must be taken into account when building investment solutions into infrastructure debt. Our analysis points firmly in the direction of a potential consensus between institutional investors looking for long-term assets like infrastructure debt and the public policy objective of having substantial amounts of new capital committed to building new infrastructure assets to support economic growth. The mechanisms found in project finance play a pivotal role to arrive at this result. For the convergence between institutional investor’s needs and public policy to occur, projects must continue to be selected on the basis of their credit quality and risk should be priced adequately according to the systematic risk factors that we discuss above, both between projects and over their lifecycle. Since the completion of the construction period in infrastructure project finance leads to a predictable credit risk migration across project and macro-level risk factors, remunerating credit risk appropriately across the lifecycle allows investors to capture substantial diversification benefits and requires that construction risk (i.e. new projects) be included in their portfolios. In turn, the public sector can get new infrastructure built to support future growth. However, it must also commit to the quality and standardisation of the contractual frameworks used to procure these projects, to the stability of the regulatory framework and to a transparent and significant pipeline of future projects leading to new debt issuance, which will prove essential to maintain portfolios of infrastructure debt at the desired level of return and risk.